Dathorne & Butler have significant trial experience at both the federal and state level. Dathorne & Butler's clients include or have included politicians, business CEOs, doctors, judges, lawyers, corrections officers and police officers. Dathorne & Butler has successfully defended some of the highest profile cases and clients in the Louisville area. Stinson found Not Guilty of Reckless Homicide and Wanton Endangerment Brian Butler, along with criminal defense lawyer Alex Dathorne, achieved an acquittal on all charges against Pleasure Ridge Park Head Football Coach Jason Stinson in a nationally significant case involving homicide and wanton endangerment charges stemming from the death of a high school football player during a practice. This case marks the first time that a coach was ever criminally charged for events that took place at a practice. McCoy found Not Guilty of Murder, Manslaughter and Reckless Homicide In another recent highly publicized case both nationally and regionally, Brian Butler and Alex Dathorne achieved a not guilty verdict on murder, manslaughter and reckless homicide charges in the matter of Commonwealth of Kentucky v. Kathryn McCoy stemming from allegations that Ms. McCoy, a Bellarmine University student-athlete, delivered and murdered her infant child in her dormitory bathroom and disposed of the infant. The law office of Dathorne & Butler, LLC will represent your criminal defense legal matters. Brian Butler and Alex Dathorne primarly handles federal and state criminal matters. Together, we have over 40 years of experience practicing criminal law. We practice as criminal defense attorneys because we have spent our entire legal careers working in this area. Brian Butler and Alex Dathorne were both former supervisors in the Commonwealth Attorney's Office in Louisville and former federal prosecutors. Aside from our prosecutorial backgrounds, we have nearly 20 years of experience together practicing as criminal defensese attorneys. During our careers as criminal defense attorneys, we have successfully handled many of the areas highest profile cases. Prior to becoming a criminal defense attorney, Brian Butler was a federal prosecutor in the United States Attorney's Office in Louisville, Kentucky. Mr. Butler is also a former chief state prosecutor in the Commonwealth Attorney's Office in Louisville. Mr. Butler supervised a unit with multiple attorneys responsible for prosecuting everything from white collar fraud to capital murder. Prior to relocating to Louisville, Brian Butler was a United States Navy Judge Advocate (JAG) where he served both as a military prosecutor and a military criminal defense attorney. 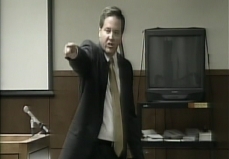 Aside from significant criminal litigation experience both as a criminal defense lawyer and as a federal, state and military prosecutor, Brian Butler is also an adjunct professor at Brandeis Law School (University of Louisville) where he periodically teaches trial skills and criminal procedure. As a prosecutor, Mr. Butler was an adjunct faculty member at the National Advocacy Center in Columbia, South Carolina where he taught trial skills to prosecutors from throughout the United States. As an Assistant United States Attorney, Brian practiced in Federal Courts in Louisville, Bowling Green, Paducah, and Owensboro. Brian prosecuted federal crimes including drug trafficking, Title III (wiretap) cases, firearms cases, violent crimes and numerous other federal crimes. Brian also redrafted and assisted in implementing the U.S. Attorney's Office's policy for selecting and prosecuting gun crimes. As an Assistant Commonwealth Attorney and Chief of General Trial Unit, Brian obtained significant trial experience handling cases such as white collar fraud, murder, robbery, domestic violence, sexual offenses, crimes against children, theft, and drug trafficking. During his tenure at the Commonwealth Attorney's Office, Brian prosecuted many of the highest profile cases in Jefferson County. As a JAG, Brian defended and prosecuted military offenses, drug trafficking, drug possession, fraud, sexual offenses, theft, and violent crime in military courts. Brian received two Navy Achievement Medals for litigation successes.